Greetings everyone, My name is Maham Saeed and I am a basic agent for a positive change in Pakistan, which I aim to accomplish through volunteering, supported by NVP-National Volunteer Programme. Volunteering gives me immense satisfaction to serve people, at the same time i am happy to get away from my routine job and indulge in something that helps me relax. 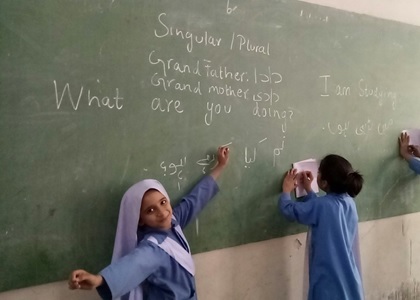 While it’s true that the more you volunteer, the more benefits you’ll experience, volunteering doesn’t have to involve a long-term commitment or take a huge amount of time out of your busy day but this is the time to play a vital role in bringing positive change in Pakistan. Zindagi Trust was the second NGO where NVP had sent me as an English teacher and the time i spent there was priceless, it gave me the feeling that I was an unsung hero to somebody somewhere and made me feel as if i was making a difference and I personally liked being a positive force in these children’s lives who oftentimes had no other positive role models. It was an unmatched feeling of utmost satisfaction and accomplishment. We all should join hands to empower and educate Pakistan and be the change we want to see in others! Thank you NVP for this amazing opportunity. To begin with, I find myself to be extremely lucky that I got a chance to volunteer at the two most renowned beneficiary institutions. 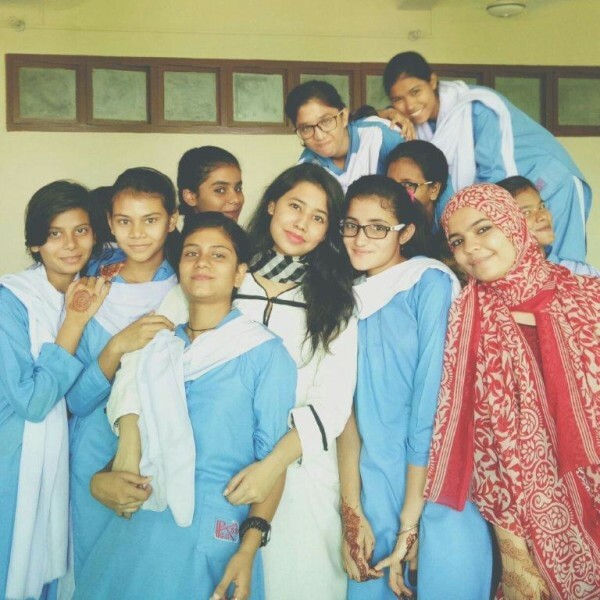 I volunteered at the SMB Fatima Jinnah Govt Girls School as a part of the Zindagi Trust foundation. I have always been really concerned about the educational sector of our country which is lagging behind in many aspects. I feel that education is the most important driving factor in order for a society to progress. I volunteered as a biology instructor for grade 9. I had an amazing time and I really enjoyed teaching them. The girls were extremely responsive and seemed keen to learn and to gain knowledge. I felt really happy to see that these young tulips are determined to move forward and achieve their goals despite of the obstacles they face on their way considering the fact they belong to poor socioeconomic backgrounds. So, teaching and spreading knowledge can eliminate many problems including poverty and hunger. Secondly, I volunteered at the Docthers which is a Renowned beneficiary institution related to the health sector. I worked as a research assistant and became aware of the health conditions in the rural areas. It was a unique experience for me. 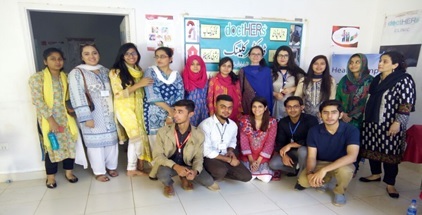 Docthers is doing a great job by connecting female doctors to the patients in the rural areas. People in the rural areas do not have access to quality healthcare. Using the telemedicine technology, Docthers serves to eradicate this problem. I feel proud that I got a chance to help them in some way. I visited their eye camp in model colony malir, and helped them in giving free eye checkups to the poor people residing there. I couldn’t have found a better way to spend my winter vacations. Lastly, I would like to thank NVP for giving me this chance, as without their support I wouldn’t be able to connect with these two institutions. I would like to thank NVP for recoginizng my skills and connecting me to the institutions that suits me best. NVP Newsletter – Issue 08 Is Up! 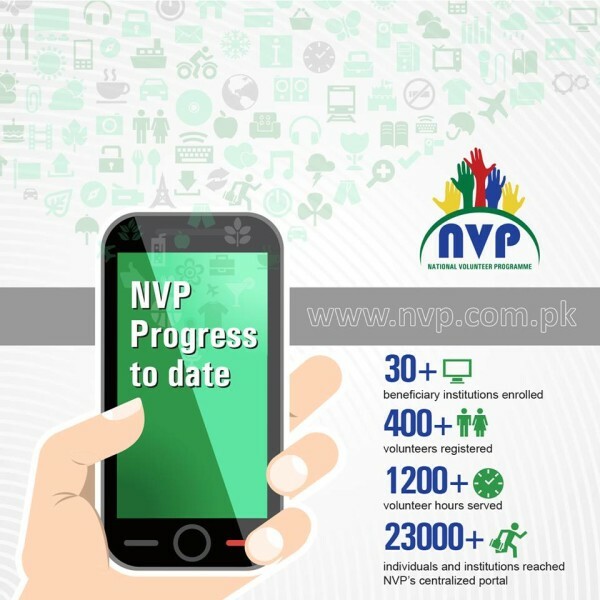 It is with great pleasure that we present to you all the 8th Issue of NVP Newsletter! National Volunteer Programme has accomplished much in a short span of time but still has a long way to go. We would like to thank all our beneficiary institutions and volunteers who have contributed towards our mission! Zindagi Trust is an NGO, primarily concerned with education. It is about school reform program. Currently we have adopted two schools, Khatoon-e- Pakistan and SMB Fatima Jinnah. In both the schools, to start with reform, first of all they consolidated the school. This is because within one premises, they were 8 different schools running and within those 8 different schools they had 8 different sets of problems. As soon as you enter SMB Fatima Jinnah, you will be pleasantly surprised to see a nice environment which was not previously so. If we sure you the before and after pictures, you can see the tremendous change in the environment of the school as well as academic achievements. We try our best to empower the children who come from very poor socio-economic backgrounds and from very low income families. This school provides a good environment for children facing multiple problems such as coming from broken homes or poor families. First of all we changed the textbooks; we brought Oxford books instead of government books especially in the core subjects like English, Maths etc. In this school we have 110 teachers from the government sector but we have almost 35 private teachers which includes subject coordinator, subject specialists etc. Zindagi Trust spends 15 Lac Rupees per month on this school to take care of its entire infrastructure. We have 25 janitorial staff and this is still not enough. We have come a long way; the physical environment of this school was in a horrible condition before. The classrooms were completely dark and dirty, desks were broken and washrooms did not have doors. We have a before and after video which we show to everyone, including the parents so that they know how this school has progressed. We have hired private teachers for the KG section because we needed teachers who were experienced and who focused on early childhood learning. At Zindagi Trust we have co-curricular activities such as with ‘AHUNG’ the organization that focuses on sexual and reproductive health education. It was very difficult to accept them in some of the schools but surprisingly in our school, the program penetrated so well. Now after the programme even our 3rd grade children know what ‘good touch ‘and what ‘bad touch’ is. So now even the small children are prepared to take care of themselves which is a very good thing. At our school, we even have mind sports. Our children even know how to play chess; In 2014, the National Champion of Pakistan at school level, was a SMB Fatima Jinnah student. If the Sindh Chess Association arranges a program, then the first 3 positions will be from SMB Fatima Jinnah. 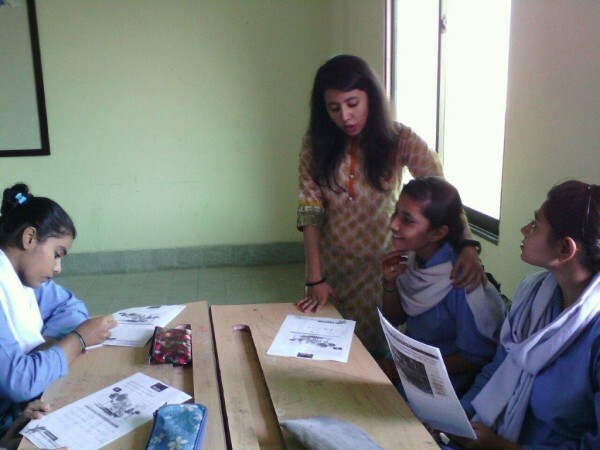 So I think Zindagi Trust has empowered the girls, they are getting very confident and vocal. Sometimes even the teachers complain that you have empowered the girls so much that they sometimes don’t listen to the teachers. However, there should always be a balance; we don’t want our students to behave badly nor do we want them to be always pressurized by the teachers. So in this way, Zindagi Trust is doing well; you can also come teach any of the subjects such as English, maths physics etc. Our children are very responsive, you would like them; they are active, they are dynamic kids and they want to learn. With volunteers they learn much better and we don’t receive any complaints from the children which we receive about their class teachers. Most of the class teachers are government teachers and they usually have their limitations. They aren’t able to teach the way youngsters like you can teach. There is a big difference from what was taught years ago and what is being taught today, so we find that youngsters are very versatile in their style and thinking which is good for the students. It’s very hard to convince government teachers to change their teaching styles and to ask the children more open-ended questions and more thought-provoking questions where they can express themselves freely. 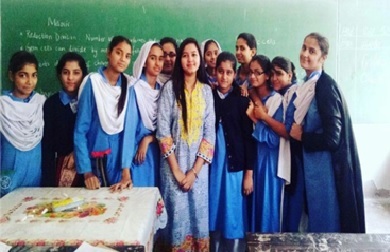 Zindagi Trust has tried its best to train government teachers as well, however, it’s always great to have youngsters like you to come in and teach or train. I would like to quote an Ayaat from the Quran ‘Jis ney kisi eik shuks ko zindagi di, us ney puray kainaat ko zindagi di’. Once the volunteers came in to teach, the children have started to love the subjects that they have previously hated. If the children are taught with enthusiasm and relate the subject to their everyday lives, they can make the children enjoy the subject more. I keep telling teachers to relate the learning to the child’s life. The volunteers may have been relating the subject to their lives which is why the children were more engrossed and engaged in the learning. Apart from the academic curriculum we have a good sports ground where volunteers can come in and teach the children any kind of sports. We have a 10,000 books library, and a teacher’s resource centre with 35,000 books. However, the coordinators and teachers don’t know how to effectively utilize it and give maximum benefit to the children. Hopefully you will find our staff very friendly and accommodating. You don’t have to commit a full week even; you can come in according to your own convenience such as 3 hours per week and we will accommodate you. You will have a great time teaching children with such different mind-sets.